Forklifts and vehicle-mount computers are essential tools in the day-to-day workflows of warehouses, manufacturing, ports, ad intermodal environments. You need to keep moving products and materials in and out all day long, without compromise, and without worrying that your vehicle-mount computer won’t be able to keep up with you workforce or your IT infrastructure. You need the Thor™ VM1A. Compact, ergonomic, and powerful, the Thor VM1A has numerous breakthrough features designed to maximize productivity, minimize visual obstructions, and reduce or eliminate downtime. The powerful Qualcomm 660 processor, integrated keyboard, and 2×2 MIMO WLAN communications keep workers connected and productive. Built to withstand extreme temperatures, the device’s large 8-inch display, readable both indoors and outdoors, supports both resistive and capacitive touchscreen options, and is available with an optional screen defroster for use in cold storage and freezer environments. 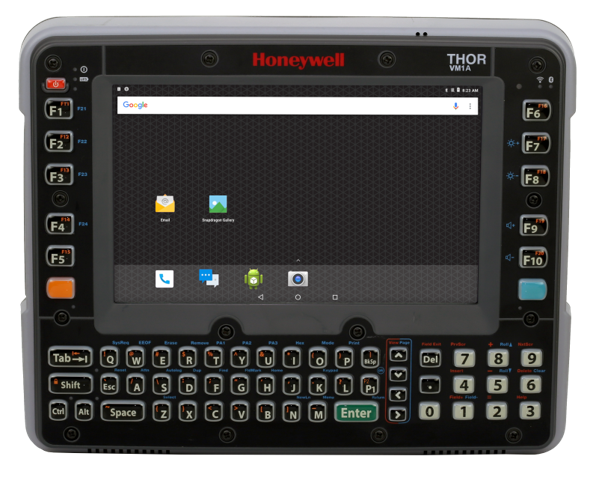 The mid-size Thor™ VM1a computer provides unprecedented flexibility for your supply chain operations. It combines a 20.32 cm (8 in) display with breakthrough innovations that deliver rapid value for your workflows. Smart Dock: Lets you mount and remove the VM1 in seconds, saving on support and maintenance costs while maximizing efficiency. Field-Replaceable Front Panel: Reduces maintenance cost by allowing you to service the most wear- and abuse-prone components yourself. Ignition Control: Eliminates the maintenance expense and lost productivity caused by a dead vehicle battery. Maximum Flexibility: Modular components, like an optional keyboard and screen defroster, give you multiple mounting possibilities. Versatile: Can be deployed in multiple application environments – from dry goods to cold storage, indoor or outdoor, in-premise or in intermodal facilities. Powerful: Features a fast 1.6 GHz Atom Z530 processor, support for Android operating system, and WWAN, WLAN & Bluetooth® wireless connectivity.